NSAC Newport Beach / Orange County, also known as The Anxiety & Depression Center, specializes in providing cognitive-behavioral therapy (CBT) to people with anxiety and depressive disorders. The Anxiety & Depression Center specializes in the treatment of Social Anxiety, Generalized Anxiety Disorder, Panic Disorder, other Anxiety Spectrum Disorders and Depressive Disorders. The Anxiety and Depression Center prides itself on the experience, training, competence and reputation of our clinicians. Every therapist in our center has advanced and specialized training in CBT. Most of our clinicians are Diplomates or Members of the Academy of Cognitive Therapy. The Academy of Cognitive Therapy is an international organization that is considered the gold standard in certifying the competence of cognitive therapists. Our therapists are active in clinical work, teaching, supervising and consulting. Robert Yeilding, Psy.D. received his Bachelor of Arts in Psychology from UCLA. He went on to earn his doctorate in Clinical Psychology from the California School of Professional Psychology. Dr. Yeilding has expertise in working with social anxiety, and working with the full spectrum of anxiety and depressive disorders. Dr. Yeilding is a Diplomate of the Academy of Cognitive Therapy. Dr. Yeilding has specialized expertise in utilizing cognitive-behavioral and mindfulness-based approaches to help manage acute symptoms of depressive, mood and anxiety disorders, as well as self-injurious behaviors. Dr. Yeilding trusts in working collaboratively with clients to relate to their thoughts, feelings and inner dialogue in each moment with compassion and non-judgment, while also actively achieving the goals of a well-developed and structured treatment plan. Dennis Greenberger, Ph.D. is a clinical psychologist and Founder and Director of the Anxiety and Depression Center in Newport Beach. He is an Associate Clinical Professor in the Department of Psychiatry, University of California, Irvine, College of Medicine where he teaches cognitive therapy to psychiatric residents. Dr. Greenberger was trained and mentored by Aaron T. Beck, M.D. the father of cognitive therapy and Judy Beck, Ph.D. at the University of Pennsylvania, Center for Cognitive Therapy and the Beck Institute for Cognitive Therapy. Dr. Greenberger is a member of the Association for the Advancement of Cognitive and Behavioral Therapies, the OC Foundation (Obsessive – Compulsive Foundation), the Anxiety Disorders Association of America, the International Association of Cognitive Therapy and is the Past President and serves on the Board of Directors of the Academy of Cognitive Therapy. Dr. Greenberger is the co- author, with Christine Padesky, Ph.D., of Mind Over Mood and the Clinicians Guide To Mind Over Mood. Mind Over Mood was named the “Most Influential Cognitive Behavioral Therapy Book” ever written by the prestigious British Association of Cognitive and Behavioral Therapies. 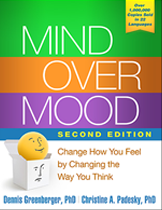 Mind Over Mood has been translated into 22 languages, sold over 1,000,000 copies and is one of the most widely read cognitive therapy books written. Dr. Greenberger oversees the clinical activities at the Anxiety and Depression Center. He meets regularly with each clinician and is involved in treatment planning and ongoing consultation. All of the center’s clinicians are experienced, compassionate and highly trained cognitive therapists. Perry Passaro, Ph.D. is a licensed psychologist and a licensed educational psychologist. He has expertise in cognitive behavioral therapy (CBT) and the application of CBT in working with children, adolescents and adults. Dr. Passaro is a Diplomate of the Academy of Cognitive Therapy. Dr. Passaro is also available to perform psychoeducational evaluations. Dr. Passaro has worked in public education for over 20 years primarily as a school psychologist. He has taught at the university level and has lectured about CBT to psychiatric residents. Dr. Passaro integrates newer findings from CBT research regarding eastern wisdom teachings (mindfulness and acceptance) into traditional CBT. Dr. Greenberger and Dr. Passaro work collaboratively in all aspects of treatment at the Anxiety and Depression Treatment Center. Shanna Farmer, MFT, is a Licensed Marriage, Family and Child Therapist. Shanna has extensive experience providing cognitive behavioral therapy to children, adolescents and adults. She is a Diplomate of the Academy of Cognitive Therapy. She is a Board Certified Expert in Traumatic Stress, and is a Diplomate with the American Academy of Experts in Traumatic Stress. Shanna has extensive experience working with social anxiety disorder, anxiety spectrum disorders and depressive disorders. In addition to depressive and anxiety disorders with adults and children Shanna is experienced in working with children with Attention Deficit Hyperactivity Disorder (ADHD), Disruptive Behavior Disorders, Autism/Aspergers Disorders, Communication Disorders and Learning Disorders. These disorders often co-exist with anxiety and depressive disorders. Shanna specializes in cognitive behavioral therapy with children adolescents and adults and has a particular interest in cognitive behavioral play therapy with young children. Shanna is an Associate Clinical Professor, University of California, Irvine, School of Medicine, Department of Psychiatry and Human Behavior. In this position she teaches psychiatric residents how to most effectively provide cognitive behavior therapy with children, adolescents and adults. Dr. Schroth earned her Bachelor’s Degree in Psychology from the University of California at Santa Barbara. She received a Master Degree and a Ph.D. in Psychology from UCLA. Dr. Schroth has been licensed as a psychologist since 1982. She has been practicing cognitive/behavioral therapy since that time and has experience treating people with a wide range of psychological problems. She has special interest and expertise in social anxiety disorder, generalized anxiety disorder, panic disorder and depressive disorders. Jamie Flack Lesser, Psy.D. is a Licensed Psychologist with a Doctorate in Clinical Psychology. Dr. Lesser is a cognitive behavioral therapist and has worked with children, adolescents, and adults in variety of settings. She has advanced training in CBT as well as specialized training in Dialectical Behavior Therapy for the treatment of Borderline Personality Disorder. Dr. Lesser has experience providing therapy to children, adolescents and adults who struggle with depression, anxiety, panic, OCD, trauma, self-harm, and behavioral problems. She also enjoys working with children and adolescents who are struggling academically or have significant family conflict. She works collaboratively with families and school administration to address school-related difficulties. Dr. Lesser is an Adjunct Faculty member at the Chicago School of Professional Psychology, and teaches courses related to evidence-based practices and cultural diversity. Dr. Lesser provides cognitive behavior therapy and dialectical behavior therapy to help people get better and make positive and enduring changes in their lives. She utilizes empirically validated treatment protocols and patient’s strengths and values to enhance their well-being and quality of life. Bryan Guthrie, LMFT NCSP, is a Licensed Marriage, Family and Child Therapist and Nationally Certified School Psychologist. Bryan is experienced in working with children and teens experiencing issues related to Social Anxiety, Depression, Mood Problems, and Behavioral Difficulties. Bryan’s treatment philosophy is that therapy is structured, collaborative and goal directed. A typical session includes homework review, agenda setting, skill building, homework assignments, and identification, evaluation and changing of the thoughts and behaviors associated with mood or behavioral problems. Treatment progress is closely and regularly monitored. When appropriate, Bryan works closely with teachers and other school team members to enhance treatment outcomes. Bryan is particularly skilled at addressing the emotional, social, behavioral and academic needs of each patient. David Lindquist, MFT, is a Licensed Marriage, Family and Child Therapist. David was a teacher, school administrator, and trainer of teachers for over twenty years. During that period of time he taught every grade from Kindergarten to the University level. He has experience in both public and private schools. He was a former Los Alamitos and Orange Country Teacher of the year. David has been a Licensed Marriage and Family Therapist since 1994 and specializes in cognitive behavior therapy with children, adolescents and adults. He has extensive post graduate training in CBT. David has post graduate training in Habit Reversal treatments and Eye Movement Desensitization and Re-Processing (EMDR) which is a particularly helpful intervention for post traumatic stress disorder. Marissa Corona, PhD is a licensed clinical psychologist who specializes in cognitive behavioral therapy and other evidenced based psychological treatments for children, adolescents, and adults. In addition to her expertise in treating anxiety and depressive disorders, Dr. Corona has specialized eating disorders training. She is one of the only certified FBT therapists (Family-Based Treatment/Maudsley) for adolescent eating disorders in Orange County. Dr. Corona received her doctorate in Child Clinical Psychology from the University of Washington and completed an internship at Stanford Children’s Hospital where she obtained training in a wide spectrum of child and adolescent disorders including anxiety, mood, and eating disorders. Dr. Corona then went on to complete a specialized eating disorders postdoctoral fellowship at the Stanford University School of Medicine Department of Child and Adolescent Psychiatry. She has worked and trained in multiple settings including hospitals, inpatient psychiatric units, and outpatient community clinics. Dr. Corona has also served as a therapist on randomized clinical trials (RCT’s) at Stanford and University of Washington. She draws from her strong training in order to provide clients with high quality, evidence-based, results oriented psychological interventions. Empirically based group sessions include psychoeducation, ongoing monitoring of progress, graduated and prolonged exposure, cognitive restructuring, anxiety management, weekly between session, homework assignments, relapse prevention. NSAC Orange County / Newport Beach offers individual psychotherapy for social anxiety and related disorders. Please contact us for more information or to discuss your situation.